Some have fallen around College Green, others on Marlborough Street, and yet more around O’Connell Street. At least 10 cyclists have logged collisions near Luas tracks that have taken place between 21 November and the present, using our crowd-sourced Bicycle Collision Tracker. On 21 December at a little after 11am, Ciarán Donnelly was cycling back home to Shankill and had just passed over O’Connell Bridge, up D’Olier Street, and round onto College Green. It was there that he ran into trouble, he said. There was a bus in the inside and he was on the outside, but a bollard blocked his way, so he had to pull into the middle of the lane. When he slowed down, the bus driver nodded for him to go on ahead. “The first thing I did was look around and see where the bus was, and he was right on top of me,” he said. The driver had slammed on the brakes. He looked shocked. Donnelly had broken two fingers and cracked his ribs, but he got back on his bike and cycled home. When he go there, his wife took him to a hospital. A little more than a week after that, Aisling Finn fell off her bike on 29 December at about 4:30pm. She was cycling along D’Olier Street, near College Green. She thought the Luas tracks were filled in, as they had been at Stephen’s Green when she had cycled past there. It’s unclear whether, or how much, the tracks were filled in, but when she was cycling between them, and had no choice but to cross over, her wheel got caught and she fell off, she said. She fractured her right wrist, got three stitches in her chin and sustained a blow to her right cheekbone. Others have come off their bikes in other parts of the city. 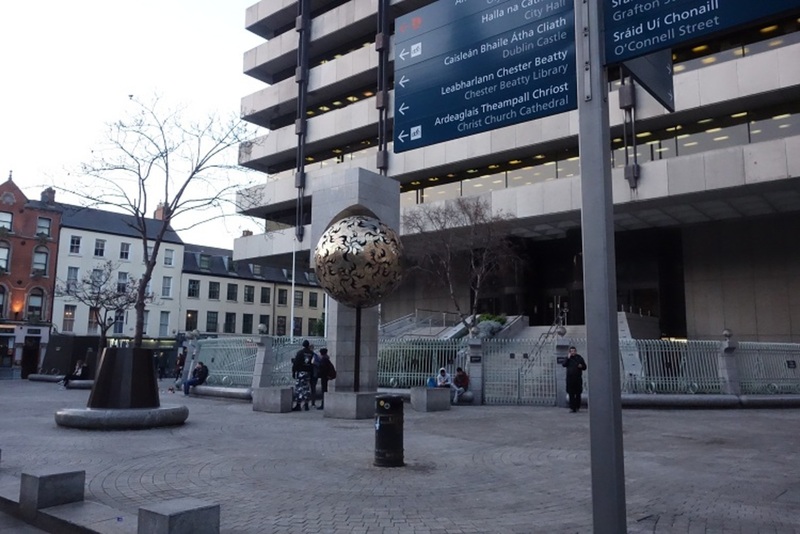 Philip Murray came down because of the Luas tracks near the Spire on O’Connell Street on 16 January, near where Henry Street and O’Connell Street meet. Luckily, the traffic was slow so the double-decker bus behind was able to brake in time. “You can only go so fast along there,” he said. Last week, Angela O’Brien got her wheels caught in the tracks on Marlborough Street. 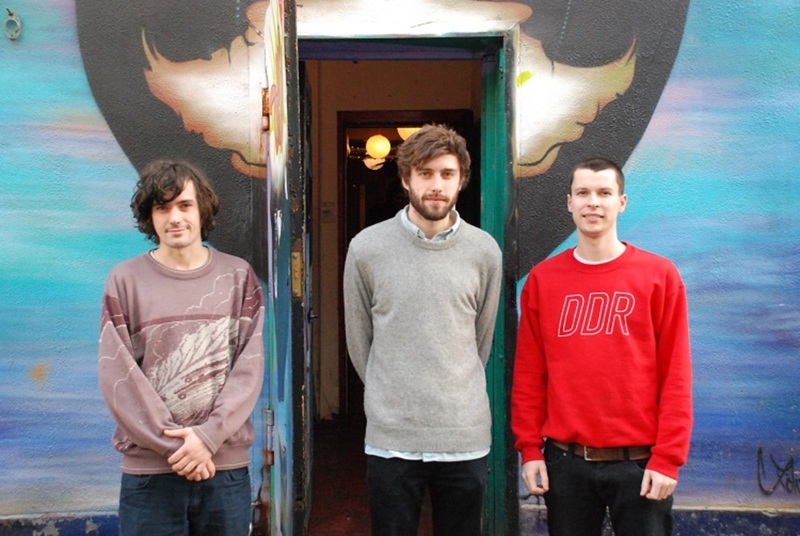 What Are Luas Cross City Doing? Those who have come off their bikes on the Luas tracks say more needs to be done to make the Luas Cross City construction sites safe for cyclists – and to make sure that, once the trams are up and running, the problems don’t continue. Grainne Mackin, a spokesperson for the Luas Cross City, said that the issue of accommodating cyclists around the construction sites has been frequently discussed internally, and with external bodies such as Dublin City Council, An Garda Síochána and the National Transport Authority over the past few years. It “is continuously under review at our weekly traffic planning and safety meetings”, she said by email. “In the case of cyclists travelling through the city streets close to our works or over the newly laid rails, this is a hazard which we cannot avoid or combat at source, that is, [Transport Infrastructure Ireland] or our contractors cannot ban cyclists from using the streets where there are Luas works,” she said. There seem to have been more signs put up in recent weeks around the city alongside painted images on the road of cyclists being thrown from their bikes. It’s unclear whether a particular incident has triggered this. Mackin didn’t respond to a query about this. Many of those who came off their bikes said they know they are supposed to approach the tracks at as close to a 90-degree angle as possible, but it just wasn’t an option. “The angle I went across on my bike, I’ve been across before on it,” said Donnelly. Perhaps, he says, it was because it was a cold morning, dry but with some frost on the ground, so there was some moisture on the tracks. He said he generally avoids Luas tracks: “I just totally avoid them.” That day, though, he just hadn’t been thinking, he said. People hear stories of crashes and it puts them off cycling, he said. He thinks that side roads should be used better for cycle ways. “While construction is going on, they should be filling the tracks in with tarmacadam,” Cuffe said. That way, bicycle wheels won’t get stuck in the grooves of the tracks. Luas Cross City is doing this, said Mackin. “Our contractor is using a combination of temporary in-filling of rail grooves, road markings and warning signage to try to reduce the risk to cyclists,” she said. But some have questioned whether the in-filling is being done carefully enough, to bring the groove level with the rest of the street. 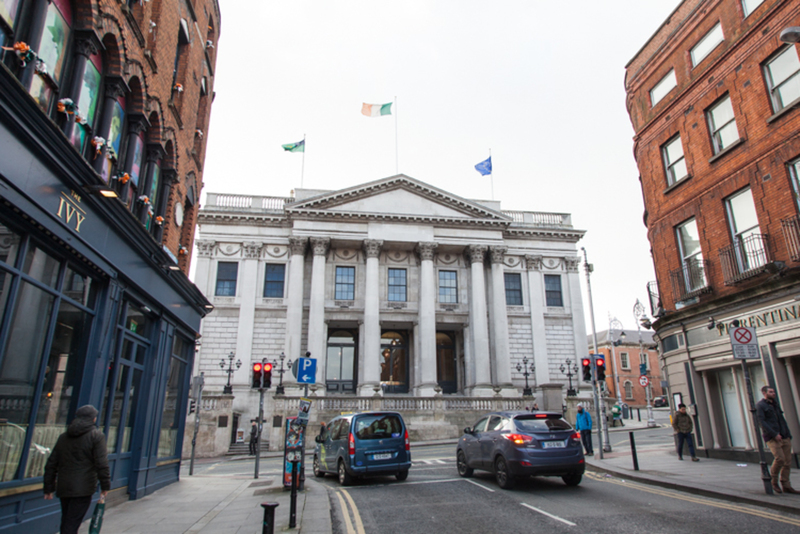 And what will happen once the Luas trams start running is still being debated. Last year, Dublin City Council wrote to the National Transport Authority (NTA) about the possibility of filling the Luas Cross City tracks with rubber to prevent accidents. But the response from NTA Chief Executive Anne Graham said that trials in Germany and Switzerland have found that it wasn’t a good solution, that the rubber filling wasn’t able to withstand the abuse of the trams running over it, and needed considerable maintenance. Cuffe says he is still pressing for more details about this though, and a fuller analysis. “I’d like to drill down a little bit more,” he said. 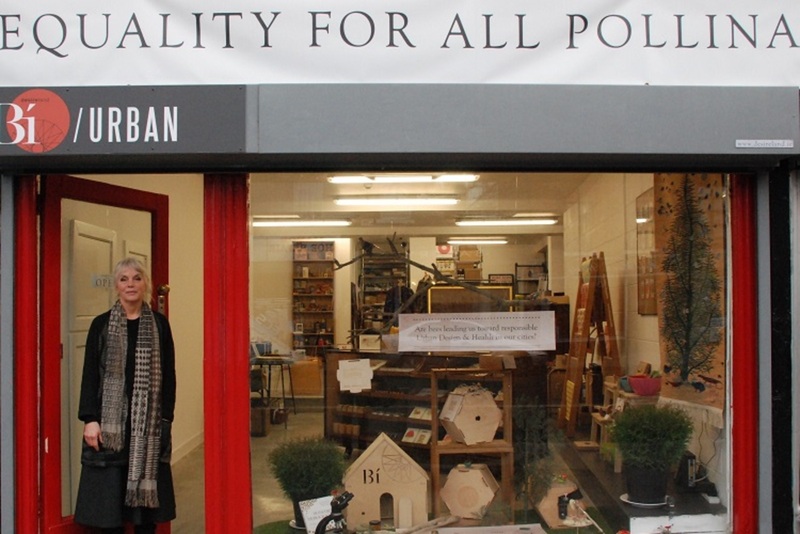 Angela O’Brien, who fell on Marlborough Street, said she called Dublin City Council, then Luas Cross City, and they were responsive, but it’s important that people flag it somehow when they’ve had accidents, she said. “I think the problem is it’s been happening to people and they haven’t rung to complain about it,” she said. Paul Corcoran of the Dublin Cycling Campaign also said that there needs to be a better reporting system for cycling injuries. The Road Safety Authority (RSA) map was last updated in 2013. “There are hidden injuries to cyclists across this city and it’s not factored in when the RSA does its statistics,” Corcoran said. He also wants to a wider campaign by Luas Cross City to educate cyclists about the tracks, and how to approach them. According to Mackin, there has been a campaign called “Be Cycle Aware”, which involved radio adverts and information signs around the city to raise awareness to the risks to cyclists around the Luas-works sites. “This campaign is run on an ongoing basis and will be intensified during 2017 as the permanent tracks and road layouts come on stream,” said Mackin. It should be possible for them to place lights along the tramlines at certain spots pretty easily. Or compressible filler in the rails that a bike could cycle over easily as it weighs a lot less. But looking at the limited actual road space they have designed for along Dawson Street, and on to O’Connell Street it’s pretty clear they plan to eliminate cycling along these routes – I can’t see where any safe provision has been designed in to keep enough space away from the rails. There will be a LOT of accidents. Like you say there are tons of side streets in Dublin that could accommodate decent safe cycle paths, but DCC still seems to insist on letting every tiny lane-way allow cars down them as a priority. It’s extremely unpleasant cycling close to tram lines at the moment. College Green is likely to be much, much worse when it’s completed. I have tried repeatedly to ascertain whether there is a safety assessment for College Green, with respect to cyclists, trams, buses and taxis all sharing the same space. Taxis are the scariest because of their speed and alarming manoeuvres – if a cyclist has to swerve because of a taxi / bus / tram, there’s a strong chance a front wheel will go into a tram line, which is almost certain to cause an accident / injury / death. This all seems to be lining up for DCC to get sued for huge amounts, rather than saving money, people’s health and possibly lives by getting serious about the problem. @Peter: Thanks for pointing out that research, Peter. I hadn’t seen that. It is very worrying. @Lois Kapila: I’m very glad you’re taking an interest in this issue, Lois. Worth asking DCC where they feel their responsibilities lie? How do they feel about not being proactive in preventing injury? And is there a safety assessment for cycling with respect to the new Luas? I imagine they will want to engage with Dublin Enquirer. @Peter: Thanks I’ll definitely ask them that. Yes, I’d be especially interested in whether there has been as safety assessment, too. Lois, Thanks so much for highlighting this issue. Something Paul Corcoran forgot to mention re safety around tram tracks is motorist awareness of needs for cyclists to cross at right angles. Many who don’t cycle themselves may completely misunderstand why a cyclist may make a sudden move of position for such a manoeuvre. Luas Cross City may be focussing on messaging cyclists but widening awareness among other road users has a place too. This seems to be currently neglected. It feels like our voices aren’t being heard and the main push around Dublin is to eliminate cycling altogether. 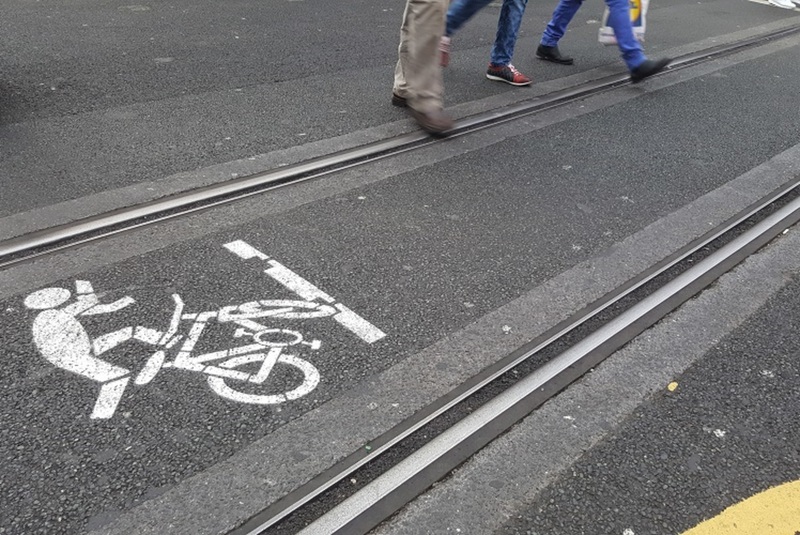 It really shouldn’t be necessary for cyclists to cross tram lines at angles – they should be able to use rubber filler material in the tram lines. I believe they use this in San Fransisco, Seattle, Zurich and Netherlands. They just need to mark safe crossing points with paint I’d imagine. @dave: The report from Portland makes for chilling reading. 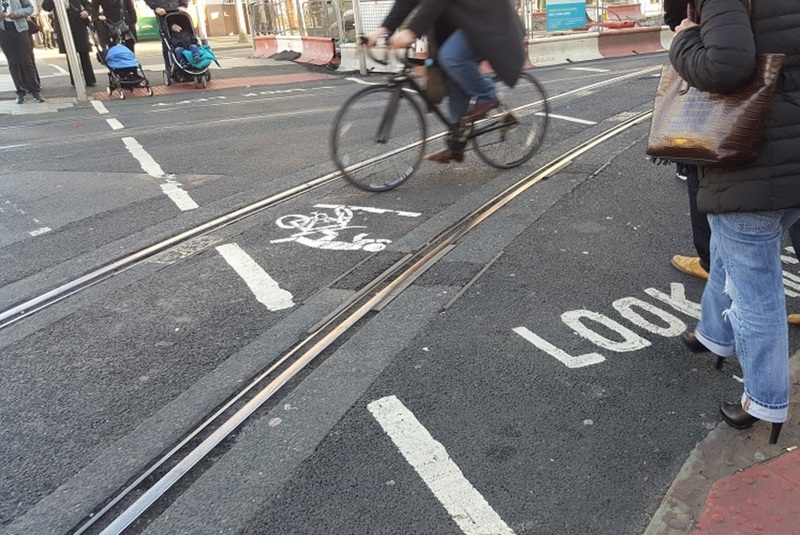 E.g., “Twelve years after Portland Streetcar added its rails to city streets, it’s still a Portland rite of passage to crash your bike on its tracks…” Does anyone know why Dublin Cycling Campaign are wholly behind Luas Cross City? It looks to me like cycling in the city centre will become associated with serious injury, which is hardly going to promote cycling. I just stumbled on these stories and they really warm my heart. I bike around Cairo a lot and it is like fighting in a hostile environment. The cars are often deferential, but there is not thought in the streets to how a bike might get through. Just today I was on a bridge with large gaps in between lanes, perfect to wedge a wheel into. Discuss these issues, but be thankful that you are discussing these issues. I came off the bike a few weeks ago at College Green, absolutely no consideration towards cyclists whatsoever. Dublin city council, get your cheque book ready as I predict many, many injuries at college green alone. Better off spending the money on doing the job properly rather than paying out compensation.